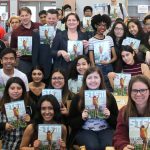 High school senior Yadira Galindo Salazar was thinking about a career in medicine until she heard Aera Energy executive Aimee Blaine speak. Aera Energy Sr. Vice President Aimee Blaine describes career opportunities in the oil and gas sector to high school students. 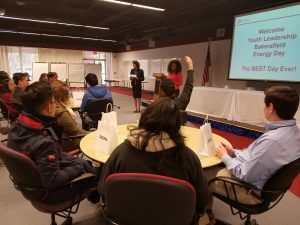 What Blaine had to say was a revelation to Salazar and 31 other Kern County high school students who visited Aera’s Bakersfield headquarters Feb. 21. Almost everything we touch, from cell phones to cosmetics to tires, is at least partly made from petroleum products. Aera produces 500,000 barrels of oil a day, or 25 percent of California’s oil production. Yet the state doesn’t produce enough oil to meet its needs. California imports 70 percent of its oil needs from other countries. The U.S. is moving toward renewable energy sources, but that transition won’t be completed for another 50 years. 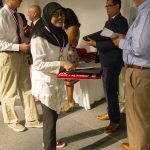 Aera recruits petroleum, mechanical, chemical, industrial and electrical engineers, as well as geoscientists, from several universities, including Stanford, UCLA and Colorado School of Mines. Engineering majors with a four-year degree can earn a starting salary of $105,000 a year in the oil and gas industry. 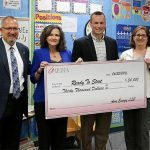 Fifty percent of Aera’s workforce is female. Women are strongly represented in the company’s management and leadership roles. 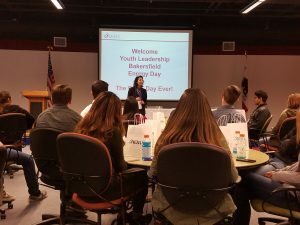 The students visited Aera as part of an “Energy Day” tour through Youth Leadership Bakersfield, a program sponsored by the Greater Bakersfield Chamber of Commerce. Earlier in the day, the group also toured Pacific Gas and Electric’s service center in southwest Bakersfield. Sammy Cortez, a senior at South High School, was excited to hear about the many career options he could pursue in the oil and gas industry. Blaine also shared her own personal career path, from petroleum engineering graduate of Louisiana State University to her first job as a drilling engineer with Mobil Oil in 1995.